Parma - Defender Andrea Ranocchia and striker Mattia Destro were cut from Italy's final 23-man squad for the European Championship on Tuesday, while defender Leonardo Bonucci was included despite reportedly being under investigation for match-fixing. 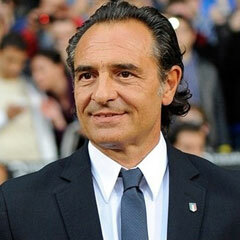 Italy coach Cesare Prandelli trimmed his provisional squad from 32 to 25 on Monday. One of the players axed was Zenit St Petersburg defender Domenico Criscito, who was officially placed under investigation for possible match-fixing when he played at Genoa. "The most annoying thing is that some people have put Bonucci's case together with Criscito's. I repeat, Bonucci has not received any official notification from the prosecutors. That's why he's coming with us to the Euros. We all want to play, to win. And to come out of it clean." Destro was left out of the squad for the June 8 to July 1 tournament in Poland and Ukraine in favour of five other forwards, including Mario Balotelli and Antonio Cassano. Ranocchia was the other man cut on the final day before squads had to be submitted to UEFA. Angelo Ogbonna, who played in the second division with Torino last season, remains with the squad. The defender played a key part in his team winning promotion to Serie A. There were injury doubts over Giorgio Chiellini and Riccardo Montolivo at the end of the league season, but both were included. Italy's first match at Euro 2012 is against Spain on June 10. The team also plays Croatia and Ireland in Group C.
Italy has only recently recovered from the 2006 match-fixing scandal - known as Calciopoli - that resulted in Juventus being relegated to Serie B for a season, plus points penalties for several other Serie A teams and lengthy bans for club and refereeing officials. "The similarities with 2006 are there," Prandelli said. "But they say in the difficult times the group unites, and that's what I hope. "But I don't believe in the theory that says that Italians only emerge in times of crisis. We also rise in times of calmness. Now the important thing is to make people understand our intention: we have to clean up football." Goalkeepers: Gianluigi Buffon (Juventus), Salvatore Sirigu (Paris Saint-Germain), Morgan De Sanctis (Napoli). Defenders: Cristian Maggio (Napoli), Ignazio Abate (AC Milan), Federico Balzaretti (Palermo), Leonardo Bonucci (Juventus), Andrea Barzagli (Juventus), Giorgio Chiellini (Juventus), Angelo Ogbonna (Torino). Midfielders: Andrea Pirlo (Juventus), Claudio Marchisio (Juventus), Emanuele Giaccherini (Juventus), Daniele De Rossi (Roma), Thiago Motta (Paris Saint-Germain), Antonio Nocerino (AC Milan), Riccardo Montolivo (Fiorentina), Alessandro Diamanti (Bologna). Strikers: Antonio Cassano (AC Milan), Mario Balotelli (Manchester City), Sebastian Giovinco (Parma), Antonio Di Natale (Udinese), Fabio Borini (Roma).